Sitting in their million-dollar home in San Diego last year, Amy and David Wolf watched globe-trotting chef Anthony Bourdain sample dishes from Detroit restaurants on his CNN show. Then they had a brainstorm. They decided to move to Detroit. The Wolfs, who have four children under 14, never had been to the city. They eventually chose the MorningSide neighborhood on the east side, an area of large brick homes with leaded glass and plaster molding. It is also a neighborhood that, despite years of help from philanthropic organizations, governments, residents and outside individuals, still appears trapped in long-term decline, a deterioration made worse by the recent mortgage crisis. “Everything is way too expensive out in California,” said Amy Wolf, 38. Detroit Mayor Mike Duggan is staking his political future on people like the Wolfs: outsiders who have bought into the promise of a Detroit neighborhood and boosted the city’s population by six. Duggan’s strategic focus has been on “stabilizing” -- the word often used by city officials -- selected city neighborhoods with an eye toward increasing Detroit’s population for the first time since the 1950 U.S. Census. Yet the challenge in MorningSide ‒ and numerous, so-called “tipping-point” neighborhoods across the city beyond downtown and Midtown ‒ is steep. Decades of decay, no matter who was mayor, no matter how much help they received, have left even the most cared-for communities struggling, seemingly resistant to widespread rebirth. The Wolfs are battling the decline by rehabbing their 79-year-old English Tudor. The three-bedroom home was abandoned when they bought it, and sits between two other abandoned houses. It cost the couple $3,000, plus $6,000 in back taxes to purchase, but needed a new kitchen, furnace, plumbing, electrical system and other items. Many of the windows were broken. They estimate the rehab will cost between $30,000 and $40,000. They moved in in February. Down the street, a man was shot and killed in March, not far from the tree where a police chase ended in December, leaving one person dead and four passengers seriously injured. Nearby, toppled trees have crashed into an abandoned home and garage, and they just sit there, as in a forest. “Our families think we’re crazy,” Amy Wolf said. Their neighborhood has a glorious past that is cherished by former and older residents who knew it as one of Detroit’s premier middle-class and working class residential and shopping districts. Even today, it features a stock of solid housing, a good location near the Grosse Pointes and the water, rising average home-sale prices and a glittering roster of generous philanthropists that include Jon Bon Jovi and General Motors. Yet despite the philanthropic love, many blocks in MorningSide remain pocked with blight. Twenty-seven percent of the homes were vacant in 2010, the most recent year data are available, and more than 20 percent of the parcels were empty lots; some are littered with trash. Crime remains an issue, though such offenses as robbery, burglary, larceny and stolen vehicles are down significantly so far this year compared with the first 15 weeks of 2008, 2009 and 2010, according to Detroit Police statistics. The commercial strips of Mack, East Warren and Harper are struggling. By any measure, it is a neighborhood trapped in a long-term downward spiral, though city officials still regard it as a neighborhood worthy of first-in-line investment to keep existing residents from fleeing. The condition of MorningSide and other neighborhoods on the city’s fix-up list present a test for Duggan because many of the root causes of the district’s woes – poverty, the national mortgage crisis and southeast Michigan’s sprawling housing market – are beyond a mayor’s control. With increased demolitions come a proliferating amount of empty land in MorningSide and across Detroit. The city now has a streamlined process through which next-door neighbors can buy a side lot for $100, and turn it into a garden or whatever zoning will allow. But residents will have to get used to blocks that have a suburban-style density, an unusual geography for a big American city. Even if the city succeeds in accomplishing those goals, one question remains: Will it be enough to save places like MorningSide? MorningSide is a rectangle, bisected by 18 long, straight streets just north of the big lawns, successful schools, abundant shopping and rapid police response of Grosse Pointe Park. East English Village, a better-preserved Detroit neighborhood but one that has blight challenges of its own, is next door to the east. To the west lies one of the city’s most devastated areas. Filled with distinctive homes ‒ many of them brick – including Tudors, colonials, Cape Cods, bungalows and two-family flats, MorningSide is shaded by ash trees and silver maples, most of its towering elms having succumbed to disease long ago. The neighborhood has been home for years to a group of dedicated activists working to revive it, and has been the focus of a remarkable amount of philanthropy, including special attention from Gov. Rick Snyder and the state of Michigan, which demolished a number of derelict homes in the past three years. 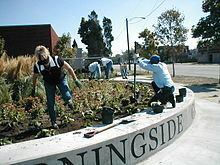 In addition to Bon Jovi, whose nationwide Soul Charitable Foundation contributed funds to building homes in 2008, people or organizations that have been involved in MorningSide include GM, Ford and Lear Corporation. Lear’s President and CEO, Matthew Simoncini, attended what is now the J. E. Clark Preparatory Academy, which sits in the middle of MorningSide. In 2012, then-General Motors CEO Dan Akerson and his wife Karin gave Habitat for Humanity $1 million of their own money to help with home construction and rehabilitation. "All you have to do is drive around the city of Detroit and you can see the economic devastation," Dan Akerson told the Free Press at the time. "The contrast between Grosse Pointe and MorningSide is pretty dramatic. You look to the left and you see one world, and you look to the right – and in my humble opinion, it shouldn't be that way in America, but it is." Habitat for Humanity began building and rehabbing houses in MorningSide in 2006, according to Dan Garan, Habitat’s construction director, and is currently constructing its 109th house. The homes have transformed once-blighted stretches of Wayburn, Maryland and Lakepointe on the western edge of the neighborhood into tidy, suburban-style landscapes. Habitat’s work has added to housing constructed earlier by U-SNAP-BAC, a local community development organization. Garan said when Habitat got involved in MorningSide, he thought that the area’s blighted housing and vacant lots needed a lot of work. “Over the last several years, the homes that have gone up and the families that are living in these houses have really strengthened the neighborhood,” he said. At Maryland and Waveney, one resident helped by Habitat, Jessie Early, a retired landscaper, was hosing down the white trim recently on the spotless frame home he shares with his sister, Charlene. Habitat remodeled the garage and installed new windows four years ago, Early said. When Early’s parents bought the house in 1972, they were the third African-American family to move into that corner of MorningSide. Their welcome was “all right,” Early recalled, but his father noted the neighborhood was already in decline. Nearby, on Wayburn, Anita Williams, 55, lives in a handsome new home that she bought 10 years ago from U-SNAP-BAC for $65,000. It has three bedrooms, a meticulously landscaped front yard, an alarm system, a video camera above the front door and bars on windows and doors. Williams, who works at Motor City Casino, said security is an issue, and she is considering buying roll-down steel shutters for two of her doors. Her last break-in took place several years ago, but she said property crime is a problem in the neighborhood. Her anxiety about safety is echoed across MorningSide, as it echoes across many relatively safe city neighborhoods. Residents and merchants complain that police are slow to respond to minor crimes – such as shoplifting and scrapping metals and other valuables from abandoned houses – that can lead to more serious problems. Despite her home’s pristine condition, Williams said she can’t get enough money to sell it. If she could, she would move to Grosse Pointe or Harper Woods. That feeling of gloominess is shared on the other side of the neighborhood, at the Hammer Time True Value Hardware, one of the oldest stores along East Warren Avenue. Inside, on the counter, is a snapshot of the avenue in the 1930s, when it was young and growing. For decades the Alger Theater and the Thomas Jefferson branch library anchored a busy shopping district that included ethnic markets, a Sanders soda fountain, music clubs and bars. The strip flourished through the 1980s. Today East Warren is largely abandoned, and last week, a two-alarm fire destroyed three remaining businesses a block away from Hammer Time, leaving the southeast corner of Audubon and Warren charred and imploded, a visual blow to one of the neighborhood’s entry points and a psychological shock to residents. “That fire is very, very, very bad,” said Zelda Anderson, president of the MorningSide Community Organization. Bill Kammann, Hammer Time’s 56-year-old owner, grew up a block away on Three Mile. When Hammer Time opened in 1991, Kammann said he realized the neighborhood was changing but figured it would have 25 prosperous years. The first unexpected blow came in 1999, when Gov. John Engler signed a bill that ended the law that required city workers to reside in Detroit. But Hammer Time continued to do well until the housing crisis hit in 2008. Kammann said business is off 40 to 45 percent since then. He notices the gradual changes when he drives home, through MorningSide, to Harper Woods. “It’s tough to see, day to day, week to week and month to month, what’s changing: a burned-out house here a vacant house there, a boarded-up house that didn’t used to be that way. It’s pretty tough out there right now. Margaret Dewar knows what the stats are. She is a professor of urban and regional planning at the University of Michigan’s Taubman School of Architecture and Urban Planning. This semester, Dewar and Libby Levy taught a course in which the students studied MorningSide. Analyzing U.S. Census data, the students found MorningSide lost 27 percent of its population between 2000 and 2010, slightly more than Detroit’s 25 percent drop that decade. They also found average income and homeownership fell. One of the biggest causes was the mortgage crisis. Another foreclosure challenge is hitting MorningSide today: Tax foreclosure. There were 607 tax foreclosures in the neighborhood in 2014 and 436 in the first 10 weeks of this year, according to the U-M group, which cited Data Driven Detroit and Loveland Technologies. That means even as the city is working to remove blight and offer homes to incoming residents, other homes are destined to become vacant. Some will be scrapped, and some will burn. There are 5,595 properties in MorningSide, and the Detroit Land Bank Authority owns 965 of them, almost one in six. The agency has targeted MorningSide, along with more than a dozen other neighborhoods, to receive a full-court press of demolitions, legal action and auctions in the coming months. Craig Fahle, the land bank’s director of public affairs, said the agency’s strategy is to demolish city-owned properties to rid the area of as much abandonment as possible before putting salvageable homes on the auction block. Fahle said MorningSide was included in the city’s first wave of demolitions and legal actions in part because it has potential, a word that surfaces often when discussing the neighborhood with city officials and residents. Can MorningSide some day look like it did 20 or 25 years ago? Mayor Duggan said he didn’t want to look to the past. Back on Courville, the Wolf family from San Diego says they are in for the duration. Amy Wolf said she believes the neighborhood is still headed downward, but she has confidence for the long term. Security is not an issue, she said. She is homeschooling the children, so there’s always someone in the house, and a bright, new LED street light hangs directly in front of their home. She hasn’t heard any gunshots. Wolf said she and her husband left behind psychological baggage and stress in California, and now it’s time to get busy in MorningSide. They love the new restaurants downtown, and the “new thinking” they have encountered among Detroiters. The U-M students whose research was cited in this report are Josh Bails, Sarah Clark, Fan Fan, Nicholas Fazio, Seul Lee, Evan Markarian, Jamie Simchik and Jacob Yan.
" Decades of decay, no matter who was mayor, no matter how much help they received, have left even the most cared-for communities struggling, seemingly resistant to widespread rebirth." It is extraordinarily difficult to make a neighborhood thrive from the top down. It's like trying to invest life into a zombie. Difficult. The vitality of a stable, prosperous neighborhood must come from its residents. And those residents must be good citizens who are capable of earning good incomes. That is not to say that Duggan's efforts to eliminate vacant, burned out houses isn't wise policy. It is. It will certainly be helpful in edging the community back from the tipping point that, once crossed, leads to nearly irreversible decline. I actually live a block down from the Wolf Family and still have yet to introduce myself. I do recall seeing them pull up to their home and thinking they probably had little to no idea what they were about to embark on. Our neighborhood is struggling still and yes, Ms.Wolf is correct in her assessment of this area, the struggle is far from over. I knew this neighborhood when I moved here. I came here as a parent of 3 children uncertain what our outcome would be. It is at times a game of survival in our community here in Morningside, one thing you quickly discover though, is that residents of Morningside possess an admirable strength to overcome all obstacles. We can't get our streets cleared of snow, but let me tell you... you will never actually get immobilized. Everyone will be out there at a moments notice to help each other, no matter what. I have grown to love my neighbors. We lost our house on a botched Land Bank Demolition, same community different street. Won the house in Auction then it was demolished. I'm only renting at the moment, but I definitely would consider staying on our block. Welcome to the Neighborhood Wolf Family! I live in Detroit near Belle Isle but am very familiar with the Morningside neighborhood and the struggles for that neighborhood to grow and thrive. Progress has definitely been made but much more needs to be done. There are many promising positive initiatives by Detroit City government and I think so fay Mayor Duggan is doing a good job---not great but good enough to make progress under very difficult circumstances, I point to the Detroit Dashboard bench marking for City services, the new attitude on Belle Isle since it became a State Park, getting through the bankruptcy with minimum pain although as a a City retiree I'm still hoping for some post bankruptcy relief to lessen my burdens and the very up front and aggressive Detroit police presence as just some of the good things done already. But more must be done and most importantly those positive changes must be maintained now and going forward. And in the longer term we must do more as a City than just apply large band aids to festering wounds. We must work to fix the root problems in Detroit like poverty, lack of opportunity and less than adequate education. Reduce poverty and increase opportunity by improving education and in the longer term---ten years or more---you will not only see a better and brighter City but a better and brighter attitude from all citizens in the City particularly those like me born in the City. Love Morning side. Lived on Three Mile Dr. for 14 years in a large Tudor style colonial. Walked away 3 years ago due to crazy neighbors and other activity that we did not want our kids around. I still visit the street but it is not the same. Boarded up and burned out houses everywhere. It is a shame. But I have not given up on the city. I still live here on the eastside in Cornerstone(Yeah Cornerstone). Beautiful street, no boarded up houses. We pay a yearly fee to have the street plowed if more than 2 inches of snow from curb to curb. Better then what the city offers at down the center only. Detroit will get better. It will take time. Some neighborhoods will never be what they were but they can be better with less.